Let me tell you, the first time you’re faced with a nearly square armhole opening, and a very rounded sleeve cap, there is a clear sense of panic. This is supposed to fit into that? Did I follow the instructions correctly? Then you squint one eye, make the other one itch by repetitive rubbing, and by touch and instinct only make it fit. 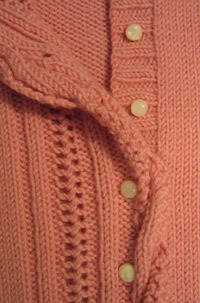 Pattern: Vintage Pink Cardigan by Norah Gaughan. Interweave Knits, Spring 2005. Weight: 0.49 kg (makes sense, 5 x 100 g skeins). I mention this because this sweater is really heavy! 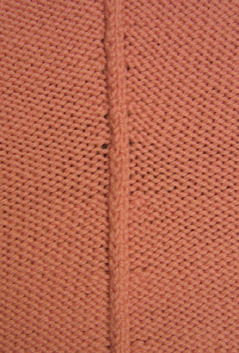 My store-bought 100% wool sweaters, with even more fabric and coverage (longer sleeves, longer length, cowl-neck, etc. ), of similar thickness, weigh only 0.30-0.35 kg! Why is that? Needles: Cheapo Boye I got second-hand from eBay, US 3 and US 5. Needles are not everything. Size: Hips: 33.5″, waist: 32″, bust: 37″. Length to shoulder: 20.5″. Modifications: 13 pages of notes. ‘Nuff said. Time to finish: 7 weeks. Genuine mother-of-pearl, antique buttons were purchased from Windsor Button. They are truly gorgeous. How about the bust increases and the two sisters? Whomp, there they are, securely contained! Did you know that this is the first cardigan that I own? I usually bust out of them, but I’m so happy with the way this one turned out. It definitely helps that the buttons are so close together, but the extra fabric in the bust area does most of the work, I think. So, my friends, this is my first adult-sized sweater. What do you think? I’m very happy with how it turned out. Would I change anything? Not really. Maybe next time I’d try a different technique for the bust shaping to see how it compares. Last, I’m completely freaked out. I wash my hands with soap before touching the sweater in any way, and I’m not sure how I can be convinced to wear it outside of the house. This is so, so beautiful and so exquisitely finished. It looks absolutely gorgeous on you and it couldn’t fit any better. I’m gushing, I can’t help it. That is gorgeous, what a wonderful knit! You’re right, the buttons are perfect. Your first adult sweater ? You did a fantastic job.It’s beautiful. Yay! Great job on a gorgeous sweater. I won’t hear of this sweater never leaving the house! You must wear this thing everywhere. Wow, great job!! I still haven’t gotten the nerve to make an adult sweater (well, since the one I talk about in my 100-things list, soon to appear on my blog I hope), so I am in awe! That sweater is a work of art! Absolutely beautiful and a wonderful fit. Wear it proudly! Wow-wow-wow! The buttons. The shaping. The finishing. The perfect fit. Huzzah! gorgeous sweater! so lovely. Congrats on a job well done! I love it! It is gorgeous on you, I hope you are so proud of yourself! I hear you about the sisters…I have the same problem. The buttons are wonderful! I need to search for such a store in my area of the world! Your sweater is beautiful. I’m impressed that it’s your first one. You did a great job. It’s obvious that you are a natural knitter. If you want to check out a different method of handling bust shaping you should try the Shapely Tank (or Shapely Tee) by Joan McGowan Micheal. She used to design for Fredricks of Hollywood. Now she does her own knitting designs. The patterns for the Shapely Tank is here. She uses short rows to create bust darts and includes waist shaping. It’s a great basic top. Her other designs are great too. beautiful….it looks perfect! What a great fit. You should be pleased! Wow! It’s so perfect for you. The fit, the color, those seams. Fantastic! You must wear it out, you must! Simply stunning! Certainly something to be un-grumpy about! Gorgeous! It’s all just perfect. Great job and I can’t wait to see what you do next. You’ve done a superb job. Any plan for the next project? Amazing! Impossible to believe that’s your first adult sweater. You are a pro! Girl, you have no reason to be grumpy now because that sweater is BEE-OO-TI-FUL!!!! I love it, and it looks sooo cute on you! I understand your apprehension about the sweater becoming “soiled”, but that sweater is too purty to be cooped up inside! Oh my goodness, look at you! Look at your fandom! I have to admit that I’m a little jealous you can whip out your first adult sized sweater in 2 months and have it be so perfect, when I really feel mine is a million steps from perfect and took over a year. Anyway, though, it looks great! You’re an inspiration! Wow, that’s your first sweater?? Very nice. Holy cow, that’s wonderful. It looks absolutely perfect on you. I’m positively green with envy. >>I usually bust out of them< (cardigans) Ho, ho, very punny!! That is a fabulous sweater! It looks wonderful on you, perfectly fitted and finished. From the closeup of the buttons, I deduce that there is a sizeable overlap under the buttonhole 'band'? Did you add this or was it part of the pattern? OK, now you can move right on to conquer the Adrienne Vittadini (sp?) sweater. And not-so-BTW, that's *definitely* a small grin, and totally deserved, on your face!! It’s great! This is my first time visiting your blog, but I had to comment and say that I love the sweater. I liked it in Interweave, but wondered how it would look on a ‘real’ person. BTW, I read your blog for at least 20 minutes, and simply cannot picture you as a grumpy person. Excellent! Let’s have a standing ovation for Grumperina and her lovely cardigan. YAY!!!! BRAVO!!! Fabulous! And the fit is wonderful! Great job. WOW. I loved that cardie when I saw it in IK, and yours is just perfect. Perfect! Stunning. This is my first time at your blog — I had no idea that grumps wore pink cardigans! Congrats! It is simply lovely! Congratulations! You look lovely in your brand new sweater. You know, I don’t even know you, but I have to say that your endowments look mighty fetching in that there sweater. (I’m normal, really. Ask Colleen, or Norma. I don’t usually compliment people on their endowments) It’s a terrific sweater for you, looks great, and I think it ‘s your colour. Beautiful knit. your sweater is amazing! it fits you perfectly. I love it! it came out perfect, especially the shaping. The buttons add a nice touch as well. Lurvly! Look at that sleeve, just sitting there all set in and ready to go. Fanfabbytastic. Forever in search of the perfect cardigan . . . that’s a beauty! I came across your blog searching for pictures of completed VPC because I can’t wait to make it this summer. Yours is beautiful! It’s hard to believe it’s your first sweater. The fit is amazing too. Congrats! That’s a gorgeous sweater! When I saw it in Interweave, I thought it was slightly too old for me to want…and now, seeing it on a real person, it looks much much, nicer. You did a better job of showing it off than the magazine, good job! And I don’t think I complemented you on the GORGEOUS sweater (or is it just that you are so gorgeous??)! What a beautiful sweater! You’ve really made it work for you–it’s so flattering. I can’t believe it’s your first sweater. Hi, I just found your blog and this sweater is scrumtious. And it is your first adult sweater? It fits perfectly and the seams are lovely (I love finishing and tend to be a tad picky about that kind of thing. Not in a bad way….) Congratulations. I love it. Especially since it’s on my list to knit, but I’ve never seen anyone else who’s made it. You used a sport weight, is that part of your 11 pages of modifications? 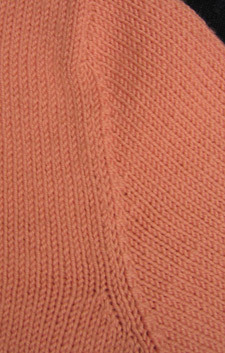 I’ve got a merino 4 ply (jaeger) to make this from, and I think it’ll be perfect. 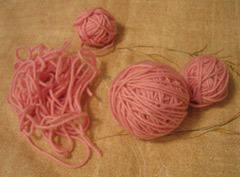 However, I’m nuts, I know, to be thinking of knitting htis in 4ply. You did a fabulous job on it, congrats! Very nice. The seaming looks great & the fit looks perfect.